McLean, Va., September 8, 2015 – Corcentric, a provider of cloud-based financial process automation solutions, today announced it will host its latest Accounts Payable Automation webinar “Break Down Barriers to E-Invoicing” on Thursday, Sept. 17, 2015 at 2:00pm ET/11:00am PT. This free, live event will show AP professionals how to overcome the barriers they face when implementing e-invoicing solutions to resistant suppliers. According to a recent PayStream Advisors report, the Invoice Management Report 2015, the persistent barriers to AP automation and e-invoicing are often due to the ongoing struggle of low supplier participation. Whether that’s due to misperception or resistance to change on the part of the supplier, the end result is the same: AP departments that want to automate their invoice approval workflow are left with paper invoices still coming in from non-participating suppliers. 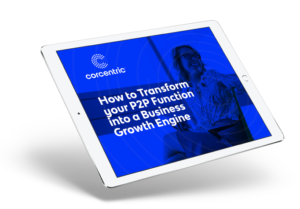 During this webinar, Rob DeVincent, Vice President of Product Marketing at Corcentric will address the main points of resistance AP departments may confront. More important, he will provide the responses that soothe those concerns. As part of the presentation, he will also detail the six supplier-focused strategies that can be used in conversations with an organization’s vendor base.